While the world is celebrating the anniversary of the World War II end, very few know a sad story of one of the heroes of that war – Meliton Kantaria. 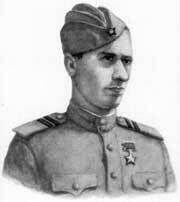 He was a Georgian sergeant of the Soviet Army who together with another soldier Mikhail Yegorov hoisted a flag Banner of Victory over the Nazi Reichstag on April 30, 1945 in Berlin, Germany. Meliton Kantaria was born to a peasant family in a small Georgian town of Jvari, Zugdidi district. Demobilized in 1946, he lived thereafter in Sukhumi, Abkazia region of Georgia. Meliton Kantaria thought that war is over forever and never comes back to his life. Unfortunately he was wrong. At age of 73 under the threat of death because of being ethnically Georgian he was forced by Abkhaz separatists and Russian occupation forces to leave his house in Sukhumi and become a refuge. 300,000 Georgians became refuges and left their homes. Meliton Kantaria was among those. Few months later after Abkhazia was totally seized by Russian occupation forces, 73 years-old WW2 Hero and just another Georgian refugee Meliton Kantaria died in a hospital. On the picture above you see two buildings. 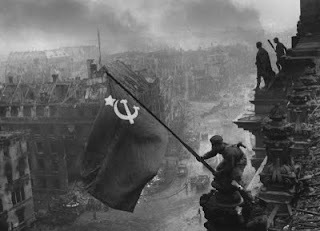 One is well known for many people – Meliton Kantaria and Mikhail Egorov are putting a flag over the Reichstag building in Berlin in 1945. Another one, rarely shown and mentioned – empty house of a refugee Meliton Kantaria in Sukhumi robbed by Abkhaz and Russian separatists in Georgia. Today President of Georgia Mikheil Saakashvili visited the tomb of the WW2 Hero Meliton Kantaria in Jvari. "An example of Meliton Kantaria is a classic reflection of the tragic fate of Georgia, because he finished his life as a refugee, driven out from Abkhazia. "- said the Georgian president.